If you translate Feng Shui literally, it's "wind-water", one of the numerous ancient Chinese Inventions. It's also called Fung Shui or Fengshui by many and the names are interchangeable. It was originally a set of skills to determine where was the best location and position for a city, a town, a palace, a tomb or other structure. It also helps determine what's the most auspicious floor plan or design of a building project. The environmental impact is seriously considered in fengshui. You may call it environtology. The main focus fengshui has is to tell if the environmental elements in a specific location is good or bad for building something important, such as a home or a tomb, and it is not always in the sense of modern environmental science. Chinese fung shui has a very close relationship with the Chinese concept Qi, or Chi , something considered as an active principle forming a part of any living thing. A close English word to it would be "energy", "flowing energy", or "vitality". Like every thing, qi has yin and yang. It serves as a fundamental part of the popular health practice Tai Chi and Chinese traditional medicines. To achieve the balance of yin qi and yang qi is one of fung shui's goals. The purpose of fung shui is to use the laws of both Heaven and Earth, or astronomy (like star maps) and geography (like the geographic features of water bodies and mountain), to choose an auspicious site and design for good. Fung shui is also used to change an unwanted situation, such as personal problems or business barriers, to a desired one for people who believe the cause of their problems is that they didn't get the fung shui right in the first place. That's why there are specific fung shui for bedroom, office, kitchen and living room, etc. Fengshui originates in the Warring period. It was based on the belief that humans and the environment should be in harmony. The skills used in early fengshui were to determine structure locations and architecture designs; aesthetics were part of the concerns. Early military usage of fengshui was mentioned in Shi Jing, an ancient Chinese literature book, in terms of how to choose a good camp site and have a good working relationship with local civilians. When it came to Qin Dynasty, fengshui began to be mixed with folk beliefs, religious beliefs, astrology, divination, necromancy, geomancy, etc.. Yin and yang have been part of it too. Theories about fengshui gets more and more complex as time goes by: details have been added and branches have grown apart. During the cultural revolution in the 1960s, fengshui was suppressed in China as superstition. After 1978, with the room for personal choice expanded and the focus shifting to economic growth, fengshui has since become popular again and its popularity continues to increase, particularly in the United States. 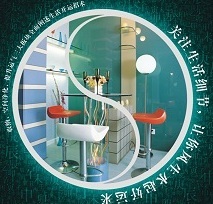 Nowadays, many interior designers, both inside and outside China, have incorporated fengshui into their works, like the one shown in the picture at left. It is used as a book cover. Can you see the Yin Yang sign? For all three dimensions, there are specific methods. The key to master fung shui is to master these methods according to the fung shui experts.